“Getting to know me. Getting to know all about me.” Sounds like a line from a very old song. Oh, hang on a minute, that’s not right. The correct words are: “Getting to know YOU! Getting to know all about YOU! Getting to like you. Getting to hope you like me.” Aka – that wonderful song from Rodgers and Hammerstein’s, The King and I.
I’ll let you do the singing because this post is all about you getting to know me, allowing you to understand a little more about the crazy lady who owns this bog and, perhaps along the way, I might even learn a thing or two about myself. During 2018 I’m going to concentrate on writing more often, and hence blogging more often, and I’m pleased to say I’m off to a good start – so far this year I’ve posted something every day! Ha, ha – at the very least, I think that’s funny. Back to the task at hand though. Over at Impromptu Promptlings, Calen uses Roberta Allen’s guided writing book, The Playful Way To Knowing Yourself, to issue forth writing prompts in a series she calls (the) “Sandbox Writing Challenge” and I’ve decided I’m going to participate as often as possible. I’m learning that I like taking up the odd challenge or two and Calen’s first is a (relatively simple) series of questions. So here I go . . .
How do you see yourself? Has your perspective of yourself changed over the last year? Have you EVER come into a new understanding of yourself? If so, what precipitated it? This photo sums me up perfectly. 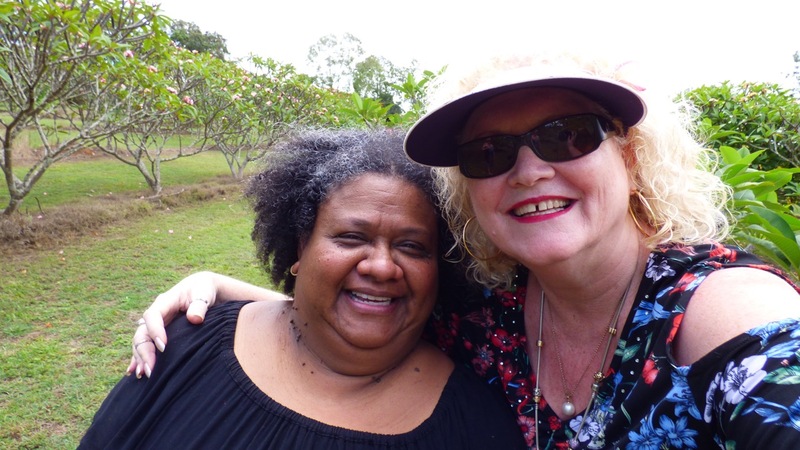 It was taken the day Lisa and I visited the Sunshine Coast Frangipani Farm. It was hot and we were getting tired of standing in the sun. As a matter of fact, I got burnt while we continued to patiently wait as cuttings were taken and information was dispensed. I can’t remember my new friend’s name and I think that’s rather sad because we talked and laughed and I took this selfie* to remember this lovely lady I met that day and the fun we had amongst the frangipanis. I don’t know where she lives, I don’t think we’ll ever see each other again, but we had a lovely time chatting and giggling like school girls misbehaving on an excursion. I love this photo because it tells me so much about myself – I look good for my age, my wrinkles are still few and far between, and those sunglasses make me look super cool. Seriously though, the photo tells me that I love to smile and be happy and that I make friends easily – I always have and I hope I always continue to do so. It tells me that I treat others the way I wish to be treated myself and that when you put good out into the world, it always comes back to you, and when it does, sometimes it returns in the most unexpected ways, sometimes it returns tenfold. If you were asked to choose seven words to describe yourself, what would they be? If you were asked to choose seven objects that have meaning for you, what objects would you choose? If you were asked to choose seven colours that have meaning for you, what colours would you choose? If you were asked to choose seven places that have meaning for you, what places would you choose? So there you have it. My first and, hopefully not my last, attempt at Calen’s challenges. I hope you’ve enjoyed getting to know me better and I’m pleased to report I’ve just learnt that sharing something personal can be cathartic. * The photo was taken with my DLSR and if you look close enough, in the left lens of my sunnies you’ll see the reflection of me holding the camera. Next Post Friend or Foe? Thanx Calen 🙂 I can’t wait for your next challenge.